Leading up to last February’s NHL trade deadline, there was a lot of talk about the Boston Bruins acquiring veteran forwards for that late season push to make the postseason after struggling to put together sustained stretches of high-level play and wins. That’s why it came as a mild surprise when Peter Chiarelli pulled the trigger on a deal for then-22-year-old Brett Connolly, the sixth overall selection in the 2010 NHL Entry Draft by the Tampa Bay Lightning. The move raised eyebrows because ‘Bolts GM Steve Yzerman was moving on from his first-ever draft choice with that organization, a player who had been selected just four spots after Chiarelli tabbed Tyler Seguin. 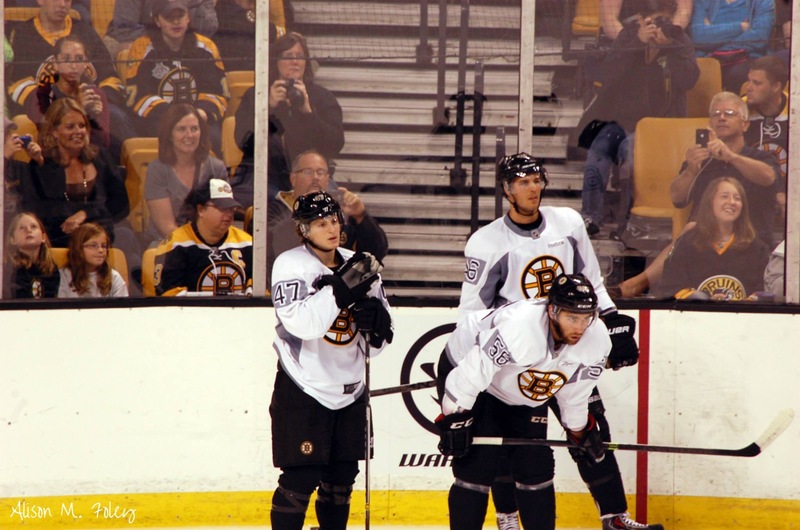 Unlike Seguin, Connolly was dealt for different reasons, and ironically enough- the player whom Boston hoped would help them earn enough points to get into the dance was felled in his very first practice with the team, missing all but five of the final 18 games, as the B’s came up short on the last night of the regular season. Connolly arrived to pro hockey with great expectations, and at least thus far, has been a disappointment given where he was drafted. 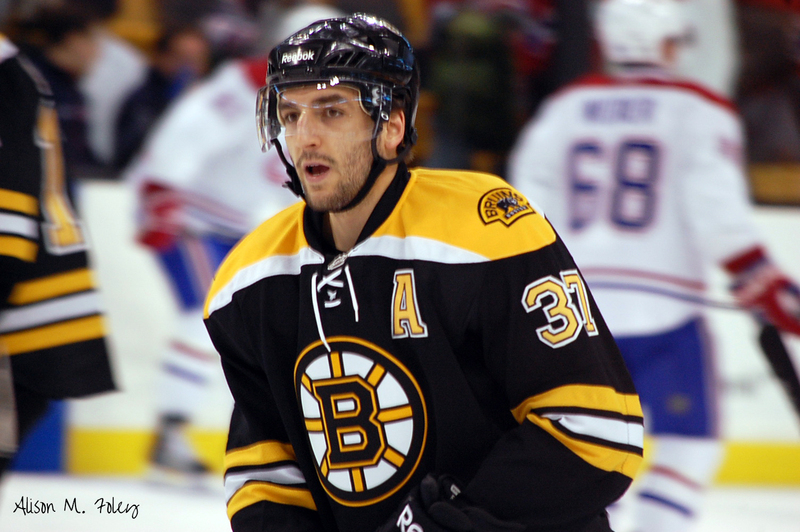 After signing a one year, $1.075 million “show me” extension with the B’s, he is in position to establish himself as a legitimate top-six NHL right wing this season on a team that was starved for goals at the 22nd overall position for offense after finishing third overall in 2013-14. In this post, we’ll take a look at Connolly then and now- and try to project what he’ll bring to Boston at age 23. 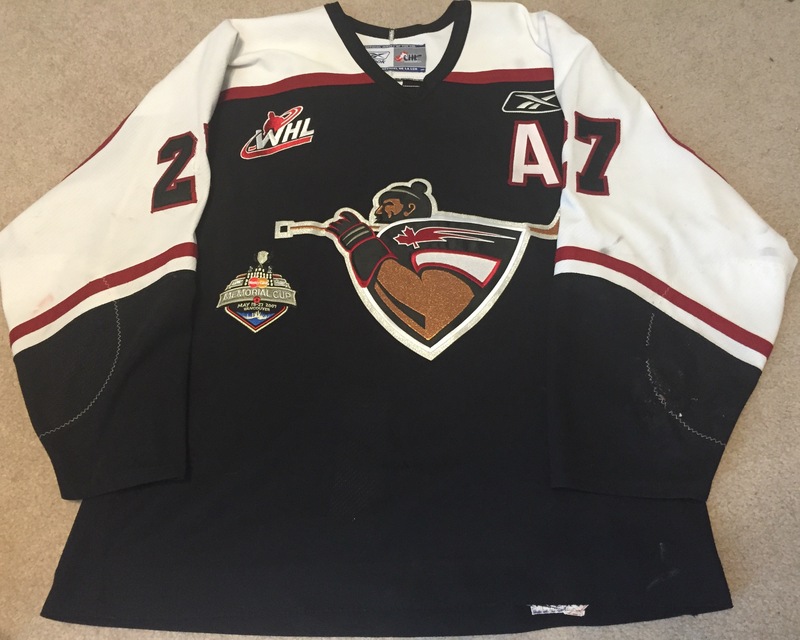 Then (the 2010 NHL draft and beyond): A little over five years ago, questions swirled around Connolly’s long-term viability because of a serious hip injury he sustained early in the 2009-10 season, which limited him to just 16 games (10 goals) for the Prince George Cougars of the WHL. A season after posting 30 goals as a rookie, Connolly was seen as the consensus top WHL player available in the 2010 NHL draft class, and though Portland Winterhawks forward Nino Niederreiter would move up to edge him by just one draft position (NY Islanders) in Los Angeles, most conceded that given a full and healthy season, Connolly had impressive potential. Take a look at this NHL draft profile, which features the late great Central Scouting director, E.J. McGuire, former Maine Mariners coach, who lost his battle with cancer in 2011. RIP E.J.- a true class act who did so much for the CSS when he was in charge. Here are excerpts from the profile I did on Connolly for my 2010 Bruins Draft Watch blog, which some of you may or may not remember. One of the most skilled and dangerous forwards in the draft had an injury-marred campaign and faces questions about his lower body’s long-term health..Excellent skater with a flash initial burst and ability to separate when observed last season before his hip problems flared up during the Ivan Hlinka tourney in August ’09. A dynamic presence when fully healthy and on top of his game: darts into open spaces with the puck and can wire it into the back of the net in the blink of an eye. Has that offensive zone killer instinct you want in your forwards; takes the puck to the net and shows off some real grit when it comes time to pay the price down low and in front of the net. Faces some major scrutiny in light of serious hip flexor injuries this season that shelved him for all of 16 games. Looked strong in a late-season stint in the WHL, but raised real concerns with his tentative, ineffective performance for Team Canada at the World Under-18 tourney in Belarus in April. Lacked explosiveness and jump in his stride. Word out of the NHL combine is that the hips aren’t chronic problems, but with the failure of New Jersey 2001 first-round pick Adrian Foster still fresh in a lot of minds, many teams can’t afford to gamble. Not an overly physical player despite a long frame that will bulk up in the next few years. Needs to add a lot of mass/fill out his lanky build. He’s got all the tools you look for in a high-end scoring wing, and it’s a shame that he had such problems with injuries this season, because it robbed him of the chance to generate a potentially intriguing draft subplot to challenge Hall and Seguin near the top. Now, he’s caught in that limbo/Twilight Zone between those publications that are steadfast in their belief that he’ll go off the board around No. 5 overall, and those who are a little more conservative and who think NHL teams will take some safer options rather than risk taking a player who could be damaged goods and never again look like the 16-year-old who scored 30 goals in the WHL. Bostonians know all too well how devastating bad hips are to a hockey player; it was a degenerative hip condition that forced Cam Neely to tearfully hobble away from the game he loved at just 31 years of age in what was a memorably heart-wrenching press conference. Teams who don’t take the potential disaster of a player who faces a lifetime of being day-to-day the way Neely was over the last five years of his career seriously may jump on Connolly well inside the top-10, but they do so knowing that if he can’t go, it could cost the jobs of those management and personnel types who made that call. Okay, so the hip hasn’t proven to be all that big a factor, though he’s had other health issues (more on that later). Tampa grabbed him early and he appeared to justify that faith in 2010-11, as he put his hip woes behind him to the tune of 46 goals in 59 WHL games. That was good enough for the team to sign him and give him a shot in the NHL for the 2011-12 campaign, but he had a bit part, scoring just 4 goals and 15 points in 68 games. With the lockout occurring the following year, he began the season with Tampa’s AHL affiliate in Syracuse and stayed there, scoring 31 goals and leading the Crunch to the AHL championship series. Unable to lock down an NHL job the following year, Connolly had another solid if unspectacular AHL outing in 2013-14 (21 goals, 57 points in 66 games). Now: A year ago, Connolly made the big club, but found himself skating on the bottom-six, where he was able to score a respectable 12 goals in 50 games at the time of his trade to Boston. Much was hoped for when he arrived, but a freak injury suffered when a Dennis Seidenberg shot in practice caused a displaced fracture in his right index finger, forcing him out of action for the next five weeks. He got into Boston’s last five games (2 assists) but could not have been 100 percent- especially for a shooter who needs his hands to be at his most effective. For a club that gave up a pair of second-round selections in 2015 (Tampa took Peterborough Petes d-man Matt Spencer) and 2016, losing Connolly when they needed him most was one more added insult to injury (pun intended), but he has never played more than 71 games in any of his pro seasons whether spent in the AHL or NHL. There always seems to be some kind of physical issue preventing him from playing a full 82-game schedule. Trotman may not predict what line Connolly will be on, but I’ll take a stab. He’ll work in early on the bottom-six with special teams time on the power play, but I think the Bruins are hoping he and Jimmy Hayes will give them enough confidence to perhaps have the confidence to trade Loui Eriksson to open up some breathing room on that right side. This is not a slight to the veteran Eriksson, but with his impending unrestricted free agency, the team cannot afford to be sentimental. If neither Connolly nor Hayes are up to the task to take on more of a scoring role for the B’s, then Claude Julien may stick with Eriksson, as he is a more proven player at this stage of his career. However, with just $3.5 million invested in the two younger wingers, that salary flexibility is how a team like Boston can get further out of the cap hell that dogged them the last two years, forcing the parting of ways with key contributors and fan favorites like Johnny Boychuk, Jarome Iginla, Milan Lucic and Dougie Hamilton. Nobody said building a Stanley Cup-caliber team would be easy, but it goes without saying that if Connolly can develop into a 25-30 or more goal scorer this year for the B’s, Don Sweeney would have more options open to him to make the club better in the present and longer term. Of course- that kind of success comes at a price and if Connolly comes through with a season like that, he’ll be looking at a hefty raise in 2016. All in due time, I suppose- and first things first. There’s a hockey season to play…in the meantime, Ralph Macchio, Pat Morita & Billy Zabka know what we’re talking about in the style of Survivor. Since letting Mike Chiarelli go after his brother was relieved of the GM duties, the Boston Bruins had been without a dedicated Ontario amateur scout. Several sources have told me that Don Sweeney, Keith Gretzky and Co. have brought longtime scout and OHL veteran talent evaluator Andrew Shaw on board. He, obviously, is not the Chicago Blackhawks forward who was instrumental in beating the B’s in the 2013 Stanley Cup final. You can read more on Shaw here- it’s a press release announcing his hiring as head scout of the OHL’s Sudbury Wolves back in 2012. Shaw is a respected presence and voice of scouting experience throughout Ontario, though the Wolves did not have the greatest of runs while he was a part of that organization. We’re in a wait-and-see pattern with his three OHL drafts as Sudbury’s scouting chief, but he did some good work with Columbus and Sarnia. To have NHL guys already coming up on the net and telling me that this is a good hire is solid enough evidence for me, so watch for news coming out of the organization in the coming days announcing Shaw formally, along with perhaps another addition in the Quebec and Maritimes (QMJHL) region. Update: Team source says yep. Shaw now in the fold- good guy, good add sayeth scouts from outside the org. NY Islanders’ Matt Martin one of his guys from Sarnia days, I’m told. 1. In retrospect: It was a season of discontent in Boston as the Bruins watched Pittsburgh smoke the hapless Buffalo Sabres on the final night of the 2014-15 regular season to take the eighth and final playoff spot in the Eastern Conference and relegate the B’s to the late spring sidelines for the first time since 2007. Goaltending played a part in Boston’s early trip to the links. Tuukka Rask and Niklas Svedberg played their part in the unsuccessful season to be sure, but you can make the case that if not for Rask’s Vezina-caliber talent on many nights, Boston’s fall from the top-eight in the East would have been even more precipitous than it was. Draft watchers will tell you that it might not have been such a bad thing for that to happen, but for a team with higher expectations going in, Rask was often the most consistent glue that gave the fans hope that a better team was hiding behind the curtain of up-and-down play. Unfortunately, Svedberg did not inspire enough confidence from head coach Claude Julien to earn more starts that might have given Rask more of an opportunity to re-charge and re-focus later in the year when every point was at a premium. Boston’s drop from having the third-best offense in 2013-14 to 22nd last year, not to mention the gaping hole Johnny Boychuk’s pre-opening night departure to Long Island certainly put a significant amount of pressure on the men between the pipes, and we can argue all day about Svedberg’s viability as an NHL backup and that his overall numbers (7-5-1, 2.33 GAA, .918 save percentage) should have been worthy of more than 18 total appearances. The plain truth is, however- Julien did not put him into games with much regularity because he didn’t believe in him. It’s the classic saw- don’t tell me how good someone is- show me. And I get it- the statistics paint a better picture of Svedberg than he showed with his playing time and overall performance. But, in the end, Julien had ample opportunity to put Svedberg in and passed, instead going with Rask to the point that the body language seemed to indicate that Boston’s starter was frustrated with not getting more of a break (I would add, too, that Julien could have thrown Jeremy Smith into an NHL game later in the year but opted not to do that, either). The fact that no other NHL team was eager to line up for the Swede’s services after Boston informed him of their decision not to re-sign him tells you that the B’s coach is not the only one who wasn’t willing to invest in Svedberg, now playing in the KHL this year. So, that brings us to the dawn of a new NHL season in Boston. 2. The view from here: Not much has changed in the state of Massachusetts since the team packed up their stuff and headed home after game 82. Rask is still the top man in net, entering the third of his eight-year, $56 million pact signed after the team’s run to the Stanley Cup final series in 2013. At 28, he is firmly in his prime and has a 2014 Vezina Trophy to go with his reputation as one of the NHL’s top workhorse netminders. Like Henrik Lundqvist, a Stanley Cup ring (as starter) still eludes him- he came oh-so-close against Chicago, but the Bruins have taken steps backwards since that first post-lockout postseason. Rask played a career-best 70 games in 2015, and in the modern NHL, these athletes are physically capable of playing all 82 games, just as former Bruin Eddie Johnston was the last goalie in team history to play every minute of the Boston season (70 games, 4200 minutes in 1963-64), but physics and reality can be two different things. Rask numbers were down compared to his previous and personal best 2013-14 campaign, but plenty of NHL clubs would embrace a guy who posted 34 wins and a .922 save percentage despite having an offense in the bottom third and a defense that often played not to lose in front of him. The questions that seed ongoing debates, however, is just because they *can* do it- *should* NHL teams entrust huge swathes of the regular season to just one player, then expect them to thrive in another potential of a maximum 28 games in the playoffs? What is the mental and emotional toll of playing so many games under the pressure-packed conditions that NHL goaltenders exist under? Some guys can handle and even thrive in that (see Brodeur, Martin) environment. Others, not as much. And- how effective the team in front of them is also factors into the equation as well. To those who would wave their hands dismissively over the concern about the number of games he’ll play in 2015-16, my response is- OF COURSE HE’S GOING TO SAY THAT! These players are professional athletes and competitors/type-A personalities! Furthermore, they also have a stake in not making public statements that would allow opponents to leverage that to an advantage against their own team. You can’t have it both ways, guys- you can’t question what players say when you don’t like what it is they are being quoted on, but then point to other things they say on the record with absolute certainty when it validates your own point of view. In other words, I would actually be critical of Rask had he come out and said “Yeah- I think 60 games is about my regular season limit and the team had better play great in front of me or the GM’s gonna have some work to do,” because you simply don’t admit weakness- even if that might constitute the proverbial elephant in the room. Rask played it exactly right, but whether he truly feels that way or not is something only he can answer and it won’t be in the Globe or anywhere else. Rask gets criticized in some circles for not having won the big games for the B’s, but that is far too simplistic an argument to make and smacks of an agenda aimed at his cap hit. His $7 million AAV is a major bone of contention for fans who think the team can spend that money better elsewhere. 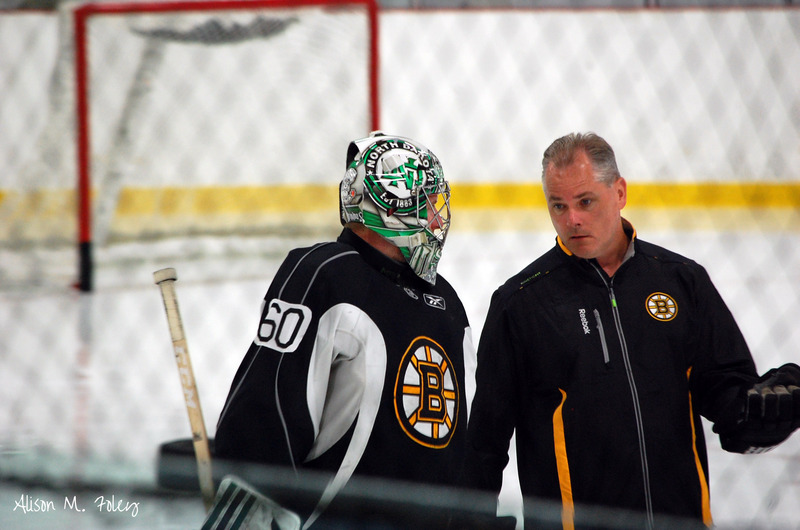 The problem with that thinking is- just who, exactly, is going to replace Rask? 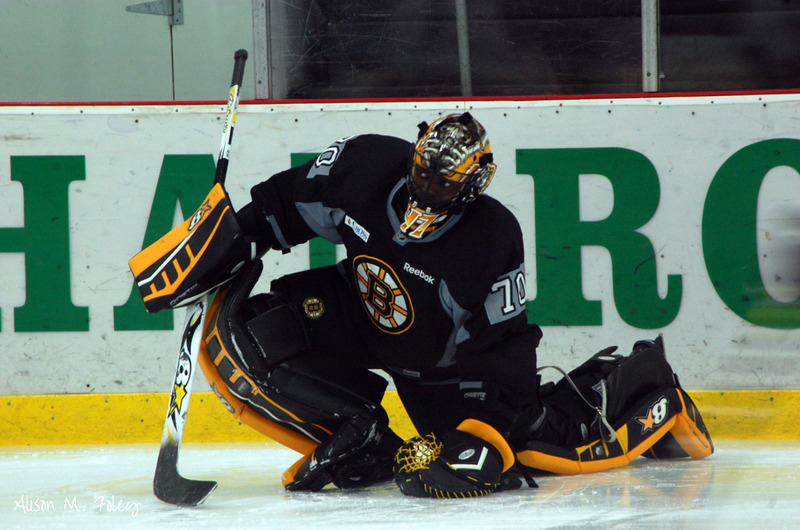 It’s absurd to argue at this point in time (August 2015) that any one of Malcolm Subban, Zane McIntyre or Smith are up to the challenge of matching Rask’s production and trust. Which brings us back to the current situation: Tuukka Rask is Boston’s main man in net and still very much in the upper tier of NHL goalies at this stage of his career. Should any of the prospects emerge with the promise to stop pucks a the NHL level, Boston GM Don Sweeney will at least have some options to go back and evaluate Rask’s long-term viability with the team, but in all reality- trading an All-Star in his prime without anything less than a guaranteed return (not bloody likely) would be a fool’s errand. The onus is on Julien and his staff to better balance Rask’s workload if they think that is the issue, but 10 shootout losses (the Bruins were actually 9-4 in OT during 4-on-4 play- a bright spot for them) a year ago says that what ails this team goes well beyond simply giving more starts to the backup. 3. Who’s No. 2? : As Yogi Berra said- it’s deja vu all over again. Boston is about to enter the season with a collective 31 minutes worth of NHL experience at the backup position split between Subban, McIntyre and Smith. Subban survived a scoreless first 20 minutes against St. Louis in his NHL debut last year by facing only a handful of shots only to see things come unraveled in an 11-minute horror show in the second, resulting in Rask coming back in for relief. You can’t put that all on Subban, and a lot of ink has been spilled arguing that he would have been in a better position making his first start against the Edmonton Oilers a few nights earlier. Either way- Subban has the talent if not the pro experience to play in the NHL. The biggest issue with that is we’re talking about a soon-to-be 22-year-old who has yet to enjoy a run as starter at the AHL level. His statistical performances in the last two years with Providence are fine- indicative of being a first-round selection, but the one crack in the armor happens to be the number of games played. Last year, Subban was expected to take the No. 1 role and run with it, but it was the AHL journeyman Smith who ultimately earned Bruce Cassidy’s trust when the games mattered most. Smith is back on the cheap with another 1-year contract. He played 39 games for Providence last season posting a highly impressive .933 save percentage. I actually saw him live in one of his worst performances (neither he nor Jeff Zatkoff had a good night in net) and although he gave up several softies in the first 40 minutes that had the Dunk Center crowd gasping in frustration, he slammed the door home in the final 10 minutes, making multiple scintillating saves before Alex Khokhlachev won the game in the final 180 seconds. Sometimes, we have to remember that way back in 2007, Smith was a top-60 NHL draft selection, so it’s not like he’s a nobody. 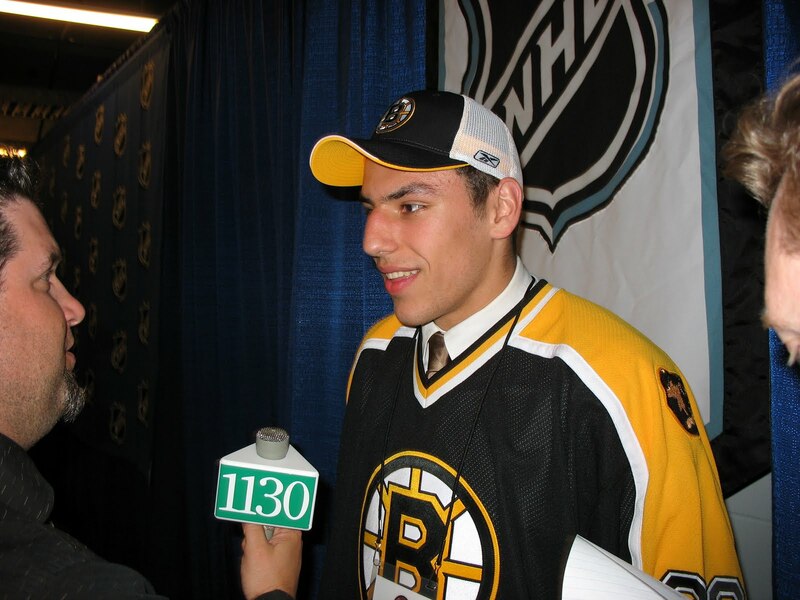 At age 25, he looked like someone who was never going to reach the NHL, but one year later, my guess is- he’ll see time in Boston if nothing else changes. What he does with that time, however, is anyone’s guess. Having said all of that- aren’t the B’s doing exactly what they did a year ago with Svedberg, who had started just one NHL game? If I have to choose today the best option between the three goalies not named Rask currently under contract, Smith makes the most sense to be the team’s backup on opening night. But, I also believe the team is risking more of the same in terms of a heavy workload for Rask and very little in the way of a safety net should he get injured at all. For those reasons, I cannot imagine them going into the new season without someone like Jonas Gustvasson or Ray Emery or even Viktor Fasth on an NHL deal to build a little risk mitigation into the equation. If you just threw up a little in your mouth at that last sentence- I hear you. But this team has too much invested in the roster to simply throw caution to the wind and trust the youngsters at this point. Subban is the most talented of the signed backup candidates, but sitting him on the bench for extended periods in lieu of forcing him to hone his technique and build up experience by establishing himself as a No. 1 at the AHL level would be a mistake. Ditto McIntyre, who doesn’t even have a pro body of work to reference. Does anyone really think that it benefits him to sit and watch most nights when Rask is taking the net and then expecting him to thrive when he goes in every fourth or fifth game? Just because he has the mental toughness and character to possibly do it doesn’t mean that he should. Finally- Smith has to be put on waivers to go down. What if…when the Bruins decided hypothetically to go with one of the kids to start the year, another team lost a goalie to injury and claims Smith away from Boston? It’s happened to Boston before and the results weren’t pretty. If you can remember the 2000-01 season when the B’s were forced to run with Andrew Raycroft and Kay Whitmore (all because Buffalo claimed the immortal Peter Skudra on waivers) in tandem, you get a gold star. That team, too, barely missed the playoffs and would have had a different fate had Byron Dafoe and John Grahame been available the whole year. 4. Looking to the future: Between Subban and McIntyre, the B’s have two promising young prospects. But that’s what they are right now…prospects. This team, as currently constructed, is hard-pressed to make the playoffs let alone contend, so there is little upside to forcing either player into the 2015-16 lineup unless injuries or their own play at the lower level gives the team no choice. McIntyre will play in the NHL one day. He’s got the right mix of talent and heart. But that day is not today, in my view. There’s a lot he can learn in the AHL, and while he undoubtedly would love to make the Bruins out of camp, he’s better served seeing some time at the pro level outside of the NHL pressure cooker. For now. But just because I think he should apprentice in the AHL first does not mean he won’t go all the way. I believe he’s got “it”- all things in good time. I like the Daniel Vladar pick in the third round this past June, but I don’t love it. He’s the epitome of what NHL clubs are trending to: massive (6-5), athletic/toolsy guys in net that give shooters very little to hit other than their oversized bodies and long limbs. The problem with Vladar right now is that technique-wise he’s a hot mess…he’s inconsistent with his stance and positioning, lets in more than a few goals that go through him- hit a portion of his body/equipment but still squeak by (coaches hate that, btw), gets real scrambly at times with his play and I’m not sure about the mental toughness yet. He’s as raw as they come, but make no mistake- he’s got the things you can’t teach, so why not? He was a solid value where the Bruins took him, so no issues on that front. Like McIntyre in 2010, he’s a long way off from being NHL ready. Vladar is playing in the USHL this year and will either go the NCAA route or probably play in one of the major junior leagues next season. So in getting back to Subban and especially McIntyre, people love to talk about the shiny new toy, but the Bruins have an obligation to cultivate and protect their assets, too. Rushing goaltenders into primetime before they are ready, no matter how much they’ve accomplished in junior or the NCAA, rarely bears fruit. There’s a time and place for it, and even Rask, who spent two full seasons in the AHL and this despite the fact that he was playing a near AHL-equivalent level in the Finnish pro league for two more years before he crossed the Atlantic, didn’t jump right in, and he had to work with Tim Thomas and spend a good deal of time sitting on the bench before he became the team’s true No. 1. That’s how it should work in most cases, and when fans apply that “fast food” mentality to goalies (Gotta have it hot and right now! ), it’s not really the way the world works. 5. The verdict: Some 2,500 words later we’re back to a basic truism: you cannot win a hockey game if you don’t score any goals. 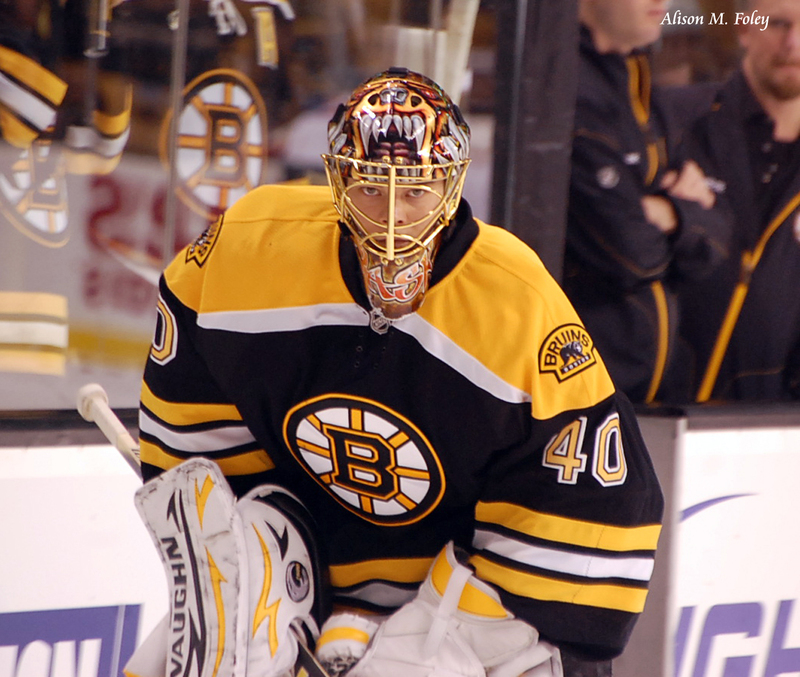 Rask will give the Bruins a chance to win every night. Unfortunately, for those who fear the team being not good enough to make the playoffs let alone contend for a Stanley Cup but being too good to finish in the basement where the Connor McDavid types (how long before we see another one like him?) fall into their laps, Rask brings little solace. He’s kind of like an in-his-prime Sean Burke, whose at times brilliance on some very mediocre Hartford Whalers teams in the early-to-mid 90’s is one of the forgotten story lines of that era. Those Whalers teams couldn’t make the playoffs, but they were on the close-but-no-cigar side of the spectrum so aside from Chris Pronger in 1993 (Burke’s worst year in the Insurance Capital), they could not build through the draft (trading their 1st rounders from 1995-97 to Boston for Glen Wesley didn’t exactly help either). Watch for the makeup of Boston’s goalie group to change before camp opens up- the team will sign someone on the cheap with NHL experience to provide competition and see how things shake out. If Smith is lights out, then maybe he earns the job, but as it stands right now, there are far more questions than answers with the No. 2. The Bruins have a winner in net, but without a quality supporting cast up front, and a capable backup the coach trusts to give the workhorse some meaningful rest throughout the marathon of a hockey season,we’ll see history repeating itself in Boston this year. Unless something changes- even when on top of his game, Rask is not enough to make the B’s more than they are: a middle-of-the-pack, bubble club to make the 2016 playoffs.